Muestre sus canciones a la industria de la música en Londres, Inglaterra, en este prestigioso e importante evento internacional de cantautores. Los jueces son ganadores de los premios Grammy, Emmy, CMA y BRIT Awards. Incluyen el productor de Sting, Kipper Eldridge, el productor Stuart Epps (bien conocido por su trabajo con Elton John, Robbie Williams, Led Zeppelin, George Harrison, Oasis), productor, compositor y director musical Simon Ellis (S Club 7, Britney Spears), estrella de la música Country y compositor Lucie Diamond, el productor y director musical Richard Niles (Paul McCartney, Kylie Minogue, Zona Boy, Mariah Carey, Take That) y Platinum Disc ganadora Natalie Chua (firmado por Simon Cowell después de ganar este concurso). Lea acerca de los jueces de aquí - en Inglés, pero puede utilizar el traductor de google. Every songwriter is given the judges score for each song and also receives an official UKSC Certificate for every song entered with details of their achievement and position. Plus, every year there are guaranteed entry gifts (worth many times the entry fee) for everyone who enters, including valuable songwriting courses from SongU and also Broadjam memberships, as well as the main winning prizes - visit The Prizes page for full details. But perhaps the main reason people enter this prestigious and popular contest is the genuine chance it offers to all songwriters to be noticed and discovered by the music industry in London and to have their songs listened to, rated and scored by industry professionals. Many entrants have received royalty earning radio play for their entries and many more have been featured in the press, in radio interviews and on prime time TV. Many entrants have been published, or have been signed and/or produced by top industry figures who closely follow this event looking for new talent. In the words of the UK's Channel 4 Television: "The UK Songwriting Contest does what it says on the tin! This is a real chance for new songwriters to break into the music business". We invite you to join us in one of the world's most prestigious, popular and important songwriting events. More details here. Join our Facebook Page, or become friends with other entrants on our Facebook Friends site. You can also interact with other songwriters at our Facebook Songwriting Community Group - the latest news and contest dates will be posted on all three UKSC Facebook Sites. "Beautifully run contest. I love this competition, communication just fantastic! Great work UKSC !!!! Many thanks for your brilliant competition!" "The UK Songwriting Contest is a great tool to open doors for your music. 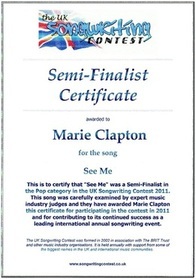 I won semi-finalist and contacted media via the web - the rewards are "pinch me is this happening?" Thanks UKSC!" - Colleen Clark (USA) Colleen was interviewed on FOX TV about her semi finalist position. "The UK Songwriting Contest does what it says on the tin! This is a real chance for new songwriters to break into the music business"
"Probably the greatest songwriting contest in the world"
This is an international contest with entries from all parts of the world and it is the favourite songwriting event of many writers from the USA, Canada, Australia, New Zealand, South America, Asia, Africa and Europe. Everyone has the same opportunity to have their work showcased to top people in the music industry in London no matter where they live. Beginners have as much chance as everyone else who enters. See the Testimonials Page for comments from songwriters. The song categories are: Pop, Lyrics Only, Singer/Songwriter, Rock, Adult Contemporary, Love Songs, Jazz & Blues, Country, Christian/Faith, R&B/HipHop/Rap, Instrumental, Open Category, Acoustic & Folk and Electronic/Dance/Ambient and Christmas Songs. Full details and descriptions of the song categories are here.